Rock for Dimes is a corporate battle of the bands held to benefit March of Dimes Canada's programs and services for children and adults with disabilities. Amateur musicians compete in this friendly fundraiser for the title of their city's best corporate band. Bands can showcase their talents in front of a roster of Canadian music industry professionals. 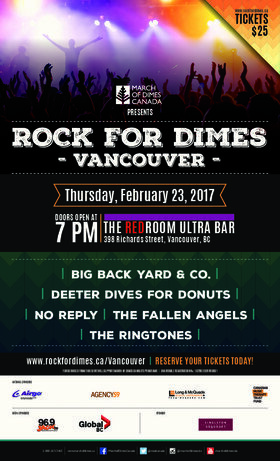 Rock for Dimes Vancouver 2017 will be held at Red Room Ultra Bar (Vancouver) on February 23, 2017. This event has become March of Dimes Canada's flagship national fundraiser and is now held in communities coast to coast. Since its inception, Rock for Dimes has raised over $1,200,000 to support our Stroke Recovery Canada® and Conductive Education® programs, and Rock for Dimes Vancouver has raised $143,000. Our goal for 2017 is to raise another $18,000 for the 11th Anniversary. With your help we can do it! We thank our national sponsors, including Long & McQuade Musical Instruments, Airgo Medical (AMG Medical), Canadian Music Therapy Trust Fund and AGENCY59. Contact us about additional sponsorship opportunities at Rock for Dimes Vancouver. 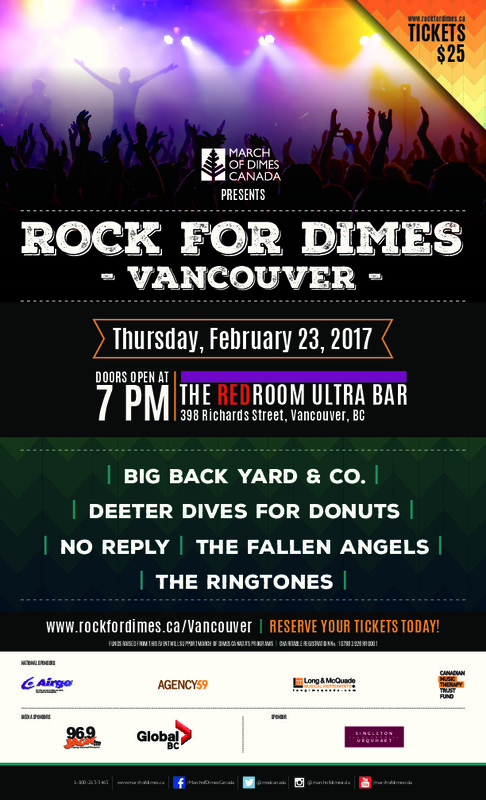 Come out and support Rock for Dimes Vancouver on February 23, 2017. Join the fun for a great cause! The current band lineup includes No Reply, The Fallen Angels, and Deeter Dives for Donuts!